5-piece brass ensemble. Quoted price is for playing 2 hours over 3 hour stay. Able to play outside with suitable cover. Chameleon Brass are a vibrant and entertaining ensemble, whose clever arrangements bring a fresh sound to some familiar tunes. From a sparkling fanfare to some more relaxed background music, this group can create the perfect atmosphere for weddings, receptions and corporate functions of all kinds. After attending music college, the ensemble members (two trumpets, French horn, trombone and tuba) have all become established freelance players. Between them they have performed with pretty well all the top orchestras in the country including the Royal Philharmonic, English National Opera, Royal Opera House, London Sinfonietta and English Symphonia. On the lighter side, assignments have included playing in the Glenn Miller Memorial Band and in the pit orchestra of the West End show Les Miserables, and accompanying artists including The Beverly Sisters, Max Bygraves, Jeremy Beadle, Gaby Roslin, Sir Harry Secombe on ‘Songs of Praise’, and 'Ant and Dec' on their live Saturday night TV show. Trombonist Steve Thompson has also written fanfares and arrangements for HRH the Prince of Wales, HRH the Princess Royal, The Rt Hon John Major MP and Lord Ashdown. 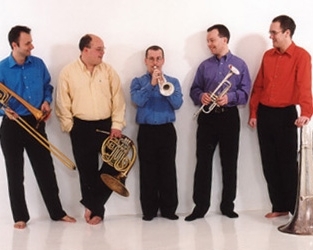 The Chameleon Brass demo tracks are taken from their first album “It's All Been Arranged”, containing such works as Bohemian Rhapsody, William Tell Overture and Porgy & Bess Suite. Our quoted price is for the five-piece ensemble that is featured on the demo CD and performance time is normally two hours over a three-hour stay. Chameleon brass are based in Surrey. See Pricing for details of travel costs, etc.